Francis Dunn, known universally as "Mother" Dunn was born in Wilkes-Barre, Pennsylvania where he grew up and attended the local schools. 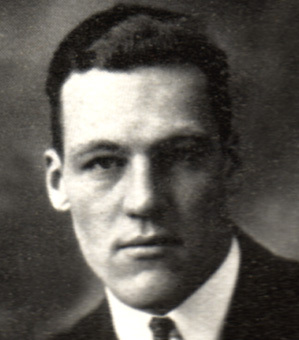 He entered Dickinson with the class of 1914 and made an immediate impact on the extra-curricular life of the College with his legendary performance in the Freshman "scrap" when, according to the 1914 Microcosm, he "picked up one Sophomore and with him as a bludgeon proceeded to lay the others on the grass." His went on to win election to the Student Senate, to the Belles Lettres Literary Society, Sigma Alpha Epsilon fraternity, Skull and Key, and the presidency of the Athletic Association. He also sang with the Glee Club and sat on the editorial board of the Microcosm. In the midst of all this, he graduated with his class - going on to attend the Dickinson School of Law - and found time to be one of the greatest all-round athletes in the institution's history. He was a center on the varsity basketball team, winning two letters, but it was at football that he excelled. He lettered all four years as a fullback, captained the side in 1912, and set numerous College records including most points in one game (30), most points in a season (84), most yards rushing in a season (114 carries for 959 yards), along with most of the other rushing and scoring marks. After graduation, while he was a student at the law school, he coached his alma mater in 1915 and in 1917, when he led them to an untied and undefeated season. He also managed at the same time to play professionally at the same time for the Canton Bulldogs under Jim Thorpe, boarding a train for Ohio at midnight on Saturday and returning Sunday night. He also worked as a custodian at the law school building. He had married and had a daughter during his senior year at Dickinson and he seemingly needed every job that he could get. He taught at the Tome School for a year and then joined the Cambria Steel Company in Johnstown, Pennsylvania, as a corporate lawyer. He served this same company till his retirement in 1969.